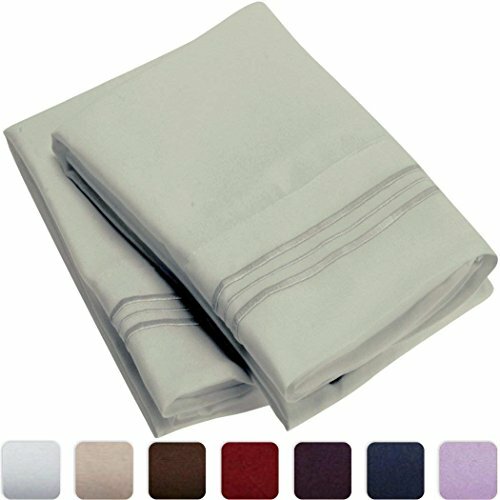 "Super Silky Soft - HIGHEST QUALITY 100% Brushed Microfiber 1800 Bedding Collections Wrinkle, Fade, Stain Resistant - Hypoallergenic Pillowcases Best For Bedroom, Guest Room, Childrens Room, RV, Vacation Home, Bed in a Bag Addition - LIFETIME GUARANTEE Fine Linens wraps you in elegance, luxury and comfort. Indulge in silky soft, 100% brushed microfiber carefully crafted in every detail. Microfiber is breathable, keep moisture, dust mites and other allergens away, hypoallergenic. Comes in Standard and King sizes. Perfect for adults, kids, toddler, teen girls and boys. These luxuries pillowcases stay fresh, cool during hot nights and warm in cold nights - leaving you and your family rested and ready for a new day. Extremely soft and comfortable!"